Today Bugaboo is Sponsoring the Forever Friends Challenge. The challenge today is to use BLUE. 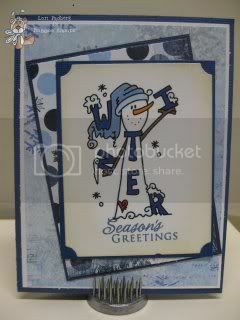 What better way to use BLUE than for a Christmas card made with a super cute snowman image called Snowman Winter. You can find him at the store by clicking on his name. Wonderful creation Lori. I love blue Christmas cards. Thanks for joinig us at Christmas Inspirations challenges. We hope you will play with us along the year. Thanks for joining us at Christmas Inspirations challenges. We hope you will play with us along the year. This is one fab card! Such a great image. Thanks for joining us at Forever Friends! What a cute snowman... thank you for joining us at crafty cardmakers this time. Your Snowman is really cute, Lori! I like the shades of blue, the card looks fantastic! Thanks for playing with us at Challenge up your life! That snowman is a real sweetie, Lori! What a fun Christmas card! Thanks for joining us at Crafty Cardmakers this time and we hope to see you again soon. i love your card! the snowman is so cute!!! Thank for joining us at Challenge up your life! Such a cute image and perfect design for our clean and simple challenge. Thanks for joining us at Paper Sundaes. You've made a fun christmas card, the image is so cute. Thanks for sharing your card with us at FOREVER FRIENDS 'Shades of Blue' challenge.